Some people want a band to play for their event for their live energy. Some want a DJ to play club music. Playlist gives you both styles of music and more. 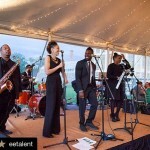 This band features young, energetic and talented singers along with experienced musicians. Playlist is the epitome of customized state of the art entertainment. And with Playlist, you not only get the experience of a high-energy live dance band, you also get the most current song list of any band their size. Playlist has a core group of six players, including three dynamic lead vocalists (two female and one male), guitar, keyboards/bass and drums. Add some extra oomph to your event by hiring up to two additional horn players to take the sound to another level. Perhaps most important, all of this comes with an incredibly affordable price tag, too! The members of Playlist together possess a combined century of studying and performance. Many of Playlist’s members have degrees from some of the nation’s top music schools. Some have toured the world and worked in the studio with internationally-known artists, such as soul sensation Raheem DeVaughn and gospel star Norman Hutchins. With a huge variety of live music available, Playlist can work with you to create an event that is a unique reflection of your personality, and one that will keep you and your guests on the dance floor all night long! Let Playlist take your vision to a new level with their energy, talent and impact. I cannot thank you and Playlist enough. You guys were INSANE. I still cannot get over how incredible you all were, SERIOUSLY. You blew everyone away—no one wanted it to end! It was a great success–the best fundraiser to date! People cannot stop raving about the band-I have been asked to request you for our next event 🙂 Thank you, thank you, THANK YOU. You guys are what made the event so incredible! I’ve been meaning to to send you this email to say “Thank you so much”!! Playlist was great! It was so nice of you to make announcements for us too. I look forward to coming to one of the spots around town to hear you all again.